Water lilies consist of several species of aquatic plants, each of which has a different behavior and configuration. Still, these plants have distinctive characteristics and some aspects of their growth are unique to the group. Some of these traits are shared by only select water lilies while others are shared by all. 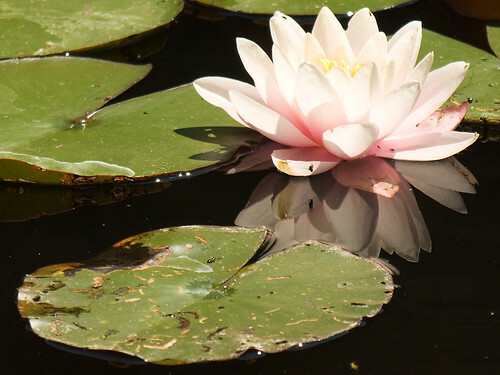 The water lily flower floats with its leaves on the surface of the water. Water lilies are spring and summer bloomers that bloom in a single elaborate and beautiful flower. Shades of water lily flower range from white and yellow to blue, purple and red with several species changing from a light to darker color as the flowering season comes to a close. The flower sometimes has as many as 24 petals and remains in bloom for only part of the day. White water lilies open in the morning while pink Comanche water lilies open in the evening. These lilies form a fruit in their center after flowering or, as in the case of the white lotus, flower as they bear their fruit. As recognizable as the lily flower are the leaves that surround it. Water lily leaves, called lily pads, are thick and buoyant leaves that float along the surface of the water in close proximity to the water lily. Lily pads do the same work as leaves on land plants, gathering sunlight for the plant to continue photosynthesis and exchanging gases. Water lily leaves are thicker than other leaves and consume a large area, sometimes larger than the flower itself. This helps lily pads stay above water even when frogs hop onto them. Many, but not all, water lilies are fragrant and produce a floral or citrus smell, depending on the species. 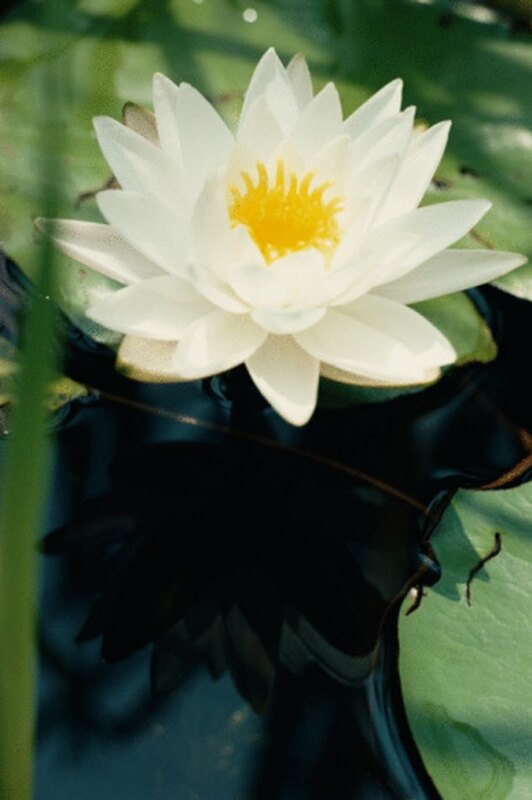 The American white water lily is sometimes called the fragrant water lily because of its clear smell. Other water lilies such as the Comanche or the Pygmaea helvola do not have fragrant flowers. The stems of all water lilies reach deep below the surface of the water and into the muck and mud of the river or pond bottom. These tough portions of the plant are more than capable of maintaining their hold even in a strong current and connect the flowering portion of the plant to the rhizomes on the bottom, which collect nitrogen and other nutrients necessary for plant development. How Does the Stem of a Water Lily Help it Grow In a Pond?